It was Supersphere CEO Lucas Wilson who said this to me, more or less verbatim, several years ago. We were enjoying a dessert of shaved milk ice in Sawtelle and the conversation had turned, predictably, to disruption in the film industry. Lucas’ words were dead-on. He was expressing two ideas here. First, he was describing the way that the old media film industry does (and does not) work. But more importantly, he was describing a smiling curve. And the smiling curve is critical in understanding both how films are made today, and where the industry is most vulnerable. again a large value capture potential in the sales and marketing phases. 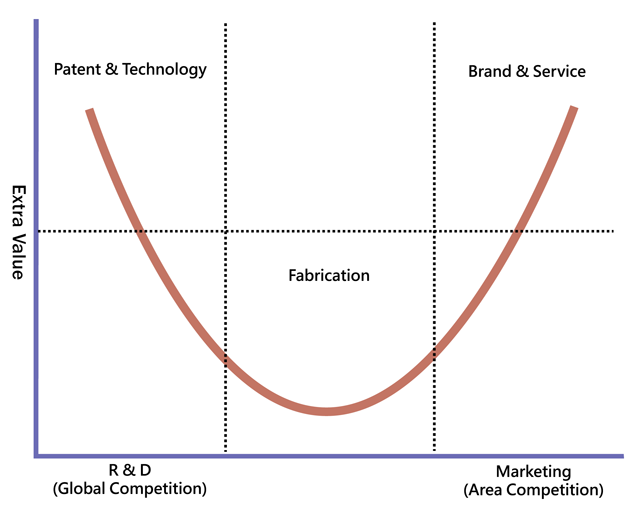 The left side of the smiling curve requires design talent, R&D budgets, and time. The right side needs established sales and distribution channels and large marketing budgets. In other words, both the left and right ends have big moats. That means fewer players—and higher margins. The middle of the smiling curve, by comparison, has lower barriers to entry. But it also has far less opportunity for differentiation. “Manufacturing” skills are simply easier to acquire. As Samsung has learned repeatedly, being a mere component supplier is your one-way ticket to commodification. And breaking out of the gravity well is no small trick. This dynamic should be familiar to any Apple customer: we know that both design/R&D (left side) and sales/marketing (right side) are based in Cupertino. That is the heart of what Apple does. Manufacturing, meanwhile, is safely outsourced to Asia. 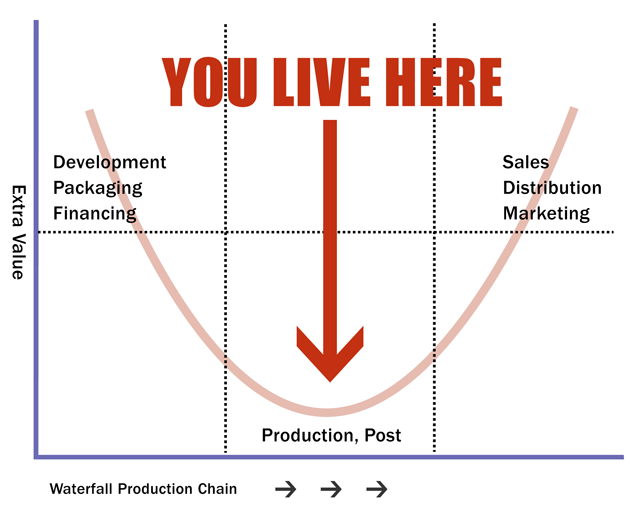 7/ Those co’s sit at the bottom of a smiling curve with "development" (packaging, financing) to the left, and sales/distro to the right. Film studios and television networks behave in much the same way. In fact, their pipelines closely mimic the waterfall production models of companies that manufacture physical products. This doesn’t mean that what you do as an artisan has no value. Far from it. But know that your work is priced accordingly. To be sure, democratizing the tools of “physical manufacture” (shooting, editing, etc.) is important. But we might reasonably conclude that disrupting film and television won’t happen by attacking the bottom of the smiling curve. That is why I previously noted, for example, that technologists are focusing on all of the wrong areas; and why I made a similar point when proposing that RED Digital Cinema, for all of its brilliance, disrupted the camera industry. But not the film industry itself. Far more interesting, then, are new companies and challengers who are focused less on “maker tools” and more on the left and right sides of the smiling curve. Let’s call them Left-side Disruptors and Right-side Disruptors. And let’s start paying a lot more attention to them.